On Your Feet Britain. Winners Blog. Special thanks to our sponsor Sit-Stand.Com who kindly donated some Yo-Yo DESKS as prizes for star participants over the years. To enter the competition in 2019 see details here. It’s simple, we need all your fun, imaginative and instructive images and videos. “Before On Your Feet (OYF) day, the majority of our staff, other than our winner Tom, spent the day working away at their desks. However, Tom’s always had a very “stand-up” approach to the working day. Tom feels more energetic and confident when he stands up on the phone, but stretching the phone and bending down to reach the computer started to become a bit of a pain for him. The sales and marketing team really enjoyed OYF as it was a chance to get moving ready for the weekend ahead, Tom actually ripped his work trousers while testing out some of his moves (luckily you can’t see that in the video!). It took us a few attempts and lots of laughs to record our Boomerang video for the OYF competition but it was all worth it when we found out we’d won. During OYF Day 2017, we started the day by doing funny dances filmed using the Instagram filter, Boomerang, for our social media pages (the video of Tracey Thake, Purple Sprout Director, was the video that won us the competition!). As the weather was so nice that day, two members of the team also went for a walk around a nearby housing estate during their lunch hour to stretch their legs. The Yo-Yo Desk MINI® is a fantastic addition to our office and is used daily by Tracey. 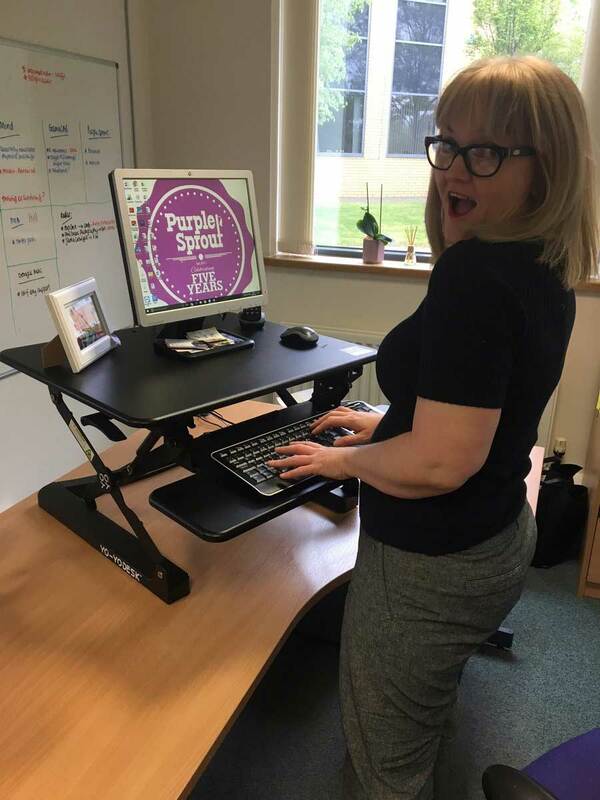 She at least tries to stand up for the first few hours of the day – motivation wasn’t needed when we googled how many calories she could burn by standing at her desk!